For an afternoon, a day or a full weekend – the Big Apple is a special opportunity to enjoy the countryside in the Herefordshire parishes on the Marcle Ridge. The local orchards are famous for their cider fruit and their excellent eating apples. Our annual Blossomtime celebration takes place as usual over the May Day bank holiday weekend of Sunday 5th and Monday 6th May 2019. These will place on Saturday 4th May 2019 at Putley Parish Hall. This will be on Saturday October 12th and Sunday October 13th, centred on the village of Much Marcle. Come and experience the apple and pear harvest, juicing, cider and perry making and much more in a number of venues. More details to come during the summer and we hope to publish the full programme in August. Another good reason to come to the Big Apple is simply to enjoy this wonderful stretch of countryside. 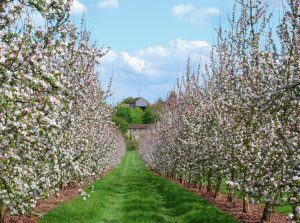 Woodlands, soft fruit fields, hopyards and grazing pastures mix with the orchards to create a lovely farming patchwork. The slopes of the Marcle Ridge offer splendid views across to the Malvern Hills to the east, while Woolhope in the west lies within the Wye Valley Area of Outstanding Natural Beauty. There is no better way to explore our deeply rural county than through its food and drink and apples and cider are at its heart. Herefordshire has more orchards than any other county and is the source of over half the UK’s cider production. For us the Marcle Ridge and the Big Apple are what Herefordshire is all about. Over the last 25 years, the number of craft food and drink producers of all kinds has truly blossomed in our local communities, providing a special experience for our visitors that is integral to the enjoyment of our rural heritage and landscape. If you want to stay for a day or two our accommodation page has a range of suggestions.